Call to lower youngsters' drink limit | What Car? A leading European safety organisation is calling for young drivers to be subject to a drink-driving limit that's 75% lower than for other UK motorists. The European Transport Safety Council (ETSC) says that 16- to 23-year-old drivers are between two and three times more likely to be killed in alcohol-related car crashes than adults. It says that young drivers have lower alcohol tolerance, lose their inhibitions faster and need to pay more attention to driving safely as they build up their skills base. 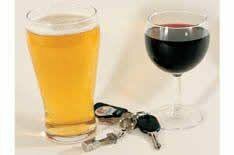 The ETSC's proposed limit, which was originally recommended by the European Union in 2001 but not acted upon, is for young drivers to be subject to a limit of 20mg of alcohol per 100ml of blood - the equivalent to around a quarter a pint of beer. The UK drink-drive limit is currently set at 80mg per 100ml of blood, roughly one pint of beer.